Newly designed case shape improves durability and oil flow amount. 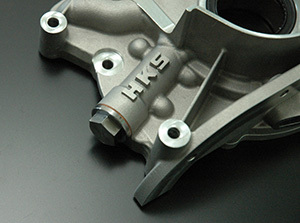 HKS Oil Pump Upgrade provides reliable oil supply for tuned engines. Larger rotor increases oil flow amount compared to the existing pump. New improved design now includes adjustable oil relief pressure (the alternator must be removed.). Utilizing outer shim enables adjustment to be visible. Thickness of driving rotor's contact portion is increased, and contact surface shape is optimized. Thickness increase and material upgrade retain twice as much of rotor strength as the stock pump. HKS Oil Pumps have reviewed the case design to retain sufficient rotor strength and to reduce oil flow resistance after applying pressure.